Looking at Lovecraft’s translation, it appears to me that the sentence should be read “backwards” as in Fhtagn wgah’nagl R’lyeh, Cthulhu mglw’nafh ph’nglui. Stick a comma between R’lyeh and Cthulhu for good measure. 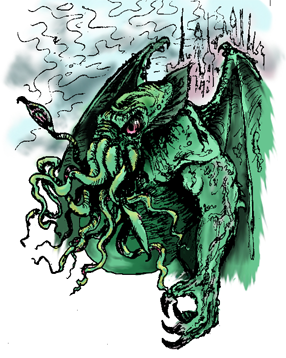 Cthulhu is, of course, Cthulhu, the agent of the sentence. Sticking to my idea of modifiers coming after their words, mglw’nafh should mean “dead”. But Cthulhu cannot actually die (at least in the human sense). Therefore, I’m making mglw’nafh mean something like “potentially active, physically inactive, dormant bodily manifestation”. ph’nglui on the other hand is translated by Lovecraft as “dreaming”. But we know that Cthulhu can influence humans with his mind. ph’nglui I am translating then as “active mental state” in contrast to mglw’nafh, “a dormant physical state”, but the word in some verbal state. Furthermore, take the words ph’nglui and wgah’nagl. Note the same consonant root in both nglui and nagl (n-g-l). Using this similarity, I’m saying that nagl refers to something “inside or within”, and nglui is an “interior mental state”. By this reasoning then, wgah’ should mean “house, abode”. I don’t know how I did it, but I’ve gone several decades without reading the work of H.P. Lovecraft. Don’t ask me how or why, but I just recently “discovered” his writings and now I’m hooked…especially his stories of the Elder Gods, Great Cthulhu, the Great Race of Yith, Yog-Sothoth and his kids Wilbur and the “horror”, etc. Very cool stuff! “But why bring him up in a conlanging blog” you may ask. The only “extensive” piece of conlanging (used in the broadest possible sense) by Lovecraft is the invocation of Cthulhu: Ph’nglui mglw’nafh Cthulhu R’lyeh wgah’nagl fhtagn which Lovecraft translated in “The Call of Cthulhu” as In his house at R’lyeh dead Cthulhu waits dreaming. There are also snippets of this language in “The Dunwich Horror” and other stories. I’m not saying that Lovecraft was a conlanger. Far from it. These phrases were purposefully put together to appear as alien and unhuman as possible. Lovecraft also talks about the Great Race of Yith’s language as a “consisting of a kind of clicking and scraping” of their “huge nippers” (“The Shadow out of Time”). It strikes me that Lovecraft is a huge untapped inspirational field for conlangers. In searching the Internet, I did find one site with a sizable dictionary and some grammar here. Even with this work, who’s to say this is the “right” one. I’ve been toying with the Cthulhu invocation and some other snippets and having an enjoyable time trying to puzzle out some sensible syntax. Lovecraft’s prose provides tantalizing glimpses and interesting snippets from which to formulate some naming languages or simple dialogue. If you’re a conlanger looking for a fertile field to toil in…jump right in…if you dare. Cthulhu fhtagn!! This novel, first published in 1894, purports to be the biography of the author’s past live as an Atlantean names Phylos. Tarzan’s first spoken language, in the original novel of 1912, was ape-speak – long before scientists discovered that apes do have a language. The exhibition’s catalogue contains a fascinating linguistic study of the words used by Tarzan’s adoptive ape clan, “the Waziris”. They have 250 words, including several verbs, which are used only in the infinitive, rather like George Orwell’s Newspeak. It is worth noting that Tarzan’s second spoken language in the original novel was French, learned from a French officer rescued from cannibals. This link gives a nice summary of the languages in Edgar Rice Burrough’s Tarzan series. Here is a nice online glossary of Mangani, the language of the apes. UPDATE: National Public Radio did a news story on the Tarzan exhibit on Aug. 11, 2009. Recently, I’ve been re-reading the Martian Tales of Edgar Rice Burroughs (or ERB), and I had forgotten about how much fun they were. It’s easily been more than 20 years since I last visited with John Carter, Tars Tarkas, and Dejah Thoris. They’re a quick read, full of adventure, bravado, and, yes, political incorrectness. However, it never ceases to surprise me that the first novel, A Princess of Mars, was serialized in 1912! With that in mind, it becomes easier to overlook ERB’s sometimes overwrought prose and political incorrectness. Just think, in 1912, the First World War hadn’t even been fought yet, less than 50 years had passed since the end of the U.S. Civil War, and Robert Goddard had just begun experimenting with rockets. True, the Barsoomian language (ERB’s name for Mars was Barsoom) is not well documented in the Martian stories. ERB was no JRRT. He did, however, provide tantalizing glimpses with words here and there and employed an exotic naming language for the Red Planet. An interesting article is posted in the Magazine Articles section of the Conlanger’s Library from ERBzine #1508 on the protolanguage of Barsoom and it’s influence on “current” Barsoomian. The novels are featured in the Books section. And “Kaor!”? That’s Barsoomian for “Hello!” Check out Jeffrey Henning’s great site at Langmaker.com on Barsoomian as well as this site. © The Conlanging Librarian. All Rights Reserved.